Watch Commencement live stream, beginning at 1:30 p.m.
No tickets will be distributed for baccalaureate and commencement. Seating in the H. S. Kuyper Fieldhouse will be available on a first come, first served basis with seating available for all guests. H. S. Kuyper Fieldhouse seating is provided in chairs and limited bleachers. *There are a number of available options for dining on campus and in Pella during commencement weekend. 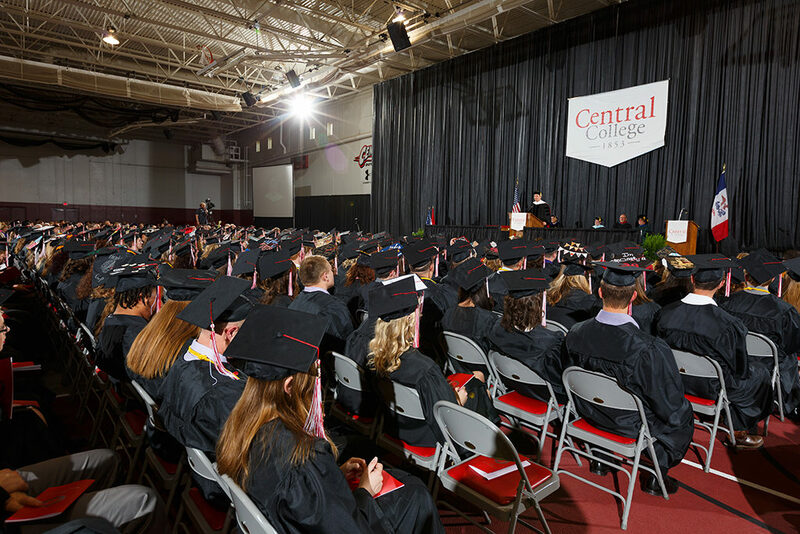 Central College Dining Services will be offering a special luncheon for graduates and their families in the Central Market from 11 a.m. – 12:30 p.m. Cost of this meal is $12 per person, graduates eat for free. Reservations are required. Please call 641-628-5154 to make your reservation. The college has rooms for lunch available for rent for families and groups. Central College Catering will be more than happy to handle all your food and beverage needs, allowing time for family and friends to celebrate. To reserve a room today, please contact Conferences & Events at 641-628-7679. In addition, Pella has many dining options.